For 90-95% I could adapt a route with better rails, railbed, etc. However, some parts (such as points/turnouts) I still have to use the old existing textures. OK, some manual adjustments, should be work. The only remaining 'problem' is that the existing rails (rail surface) often shine a lot, actually too exaggerated. 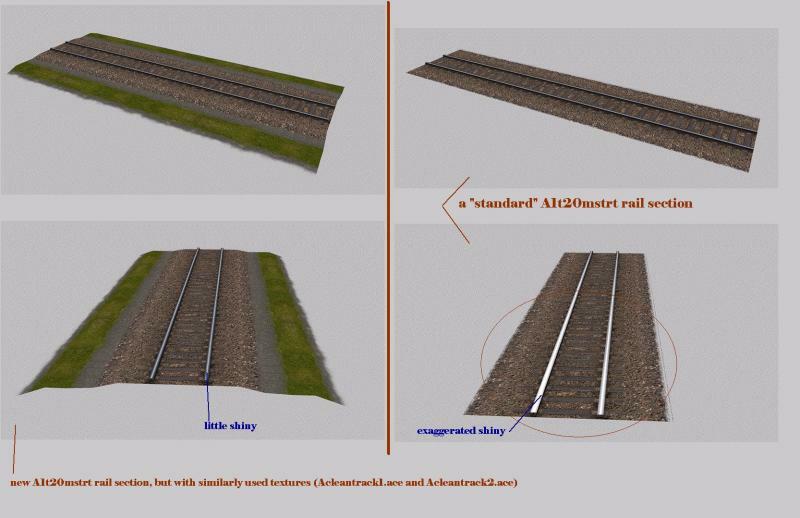 I now notice that if I use the same textures (Acleantrack1.ace and Acleantrack2.ace) on the new rails this problem does not exist ??? (a little gleam at 'backlight', but not so exaggerated). Can you adjust this manually in some way or is this just impossible? There is a low shine texture mode, or is that the something you tried that didn't work? Remember that "low shine" and "high shine" work funky in OR. Low shine is diffuse and reflects from a wider number of angles (which makes it look brighter), high shine is extremely focused and reflects from a very small number of angles (effectively, it rarely reflects light at all). The overall effect is that "low shine" is high shine and "high shine" is low shine. I understand the explanation, but I think I have too little knowledge what exactly is the "low / high shine texture mode"? After a lot of experimenting today again (trying on error), I am pretty convinced that it is not the texture (ACleartrack.2.ace). the problem with the extreme shiny rail surface has disappeared. Wouldn't "Shape File Manager" help with this also - it allows your to play with the specular settings on any given shape ? Yes, I use "Shape File Manager" to convert the file as A1txxx.s to the .txt file (and vice versa). Are there any other options that you can use? I do not know? I see what you mean. Now I also know why I never use this tool because (un)compress does not work. Probably a Windows10 problem or something? But if I do it manually (ffeditc_unicode.exe etc.) and I notice that you have to call the ".txt" file as ".s" file (logical .....? ), you can see the options in the Shapefile manager as you state. The 'old' rails have two matrices 0 = 'normal' and 1 = 'hi shine' in option "texturesmode", the "new" rails have one matrix 0 = 'normal'. However, the adjustment "1" or "0" in "tex_idxs " (as indicated above) has no effect on this setting in Shape file manager, but only visually as already indicated. The overall effect is that "low shine" is high angle shine and "high shine" is low angle shine. Erick, I take it that's the reverse of MSTS, yes? Is so, surely the action to fix this is in the shaders and not our models. OTOH if MSTS was the same... well... then your explanation is very valuable. Gosh... that is a surprise. SFM is my go-to uncompress tool. I didn't start using it until, oh, 2 years or so ago... too many times other uncompress functions failed but then I tried SFM and it did the job. I've never looked back. Does it rely upon any KUJU software?